Any space livens up by simply administering the light. It is important to take care of the natural light source. The natural light should be enhanced by the use of light colored walls. The other aspect that needs to be kept in mind is the artificial source of lighting. As the Use Of Different Lights In A Bathroom Can Make It Look Stylish. The fixtures should be placed such that, once they create a statement about the space, second, should be placed on, over and around the mirrors so as to improve the reflected light. There is a wide choice available on the market today. The use of the type of the fixtures can help to determine a theme if one is being followed. The color palette of the bathroom depends to a large extent on the size of the room. For instance, to have a feel of a bigger space in a small bathroom one needs to prefer white and bright palette. Whilst, if the bathroom is quite big, then it could have a gray, brown or darker colors as its palette. The basin is one of the primary elements in the modern bathrooms. Apart from the design, color, and material, one should choose the sink in accordance with the bathing area. If the bathing area is separate or has a Jacuzzi or shower plate, then one can go in for a sink with under the sink cabinet or vanity. But, make sure to choose the best bathroom countertop. And, if the sink is right adjacent to the bathing area one should go in for a pedestal sink or a wall mounted sink. The walls can be clad with tiles with patterns, theme, cartoons, 3d tiles, etc. These days there is a vast variety available to a large extent and the tiles give a refreshing look to the bathroom. For a rustic feel, one should go in for the traditional cement tiles or exposed pointed brickwork. The tiles help in adding a character to the space helping in breaking the monotony of the space. The patterns should accrue to the size of the bathroom, like a small bathroom can have a feel of a bigger space, if the tiles on the floors follow a vertical pattern while those on the ground follow a horizontal pattern. Space can be divided by means of glass or fabric depending on the size of the bathroom. The curtains or glass partitions can be left in solid colors or can have quotes printed or etched onto them or with some graphics like comic strips, a caricature depicting the activity of the space, a natural scape and whatever the users relate to. The base should be kept translucent in order to maintain visual lightness. Partitions should be avoided in small spaces. One can give life to this boring space by giving a hint of greenery to it. Plants can be kept on sink platforms or near the bathtub to add color to space and give it a sense of light. One can experiment with the various accessories in the bathroom like the unconventional tissue holders, soap dispensers etc. The other add-on could be fragrance diffusers, to give the space a personalized effect. Do take a read to Bathroom Guide-Wall Mixer vs. Diverter- What To Buy? Mirrors hold importance in two ways – one its usual use to reflect light and also whatever comes in front of it; the other reason is that it helps to give the space depth, a small room starts looking bigger if a full height mirror is used in the room. Mirrors can be put as it is, with a frame or be installed as an art piece. 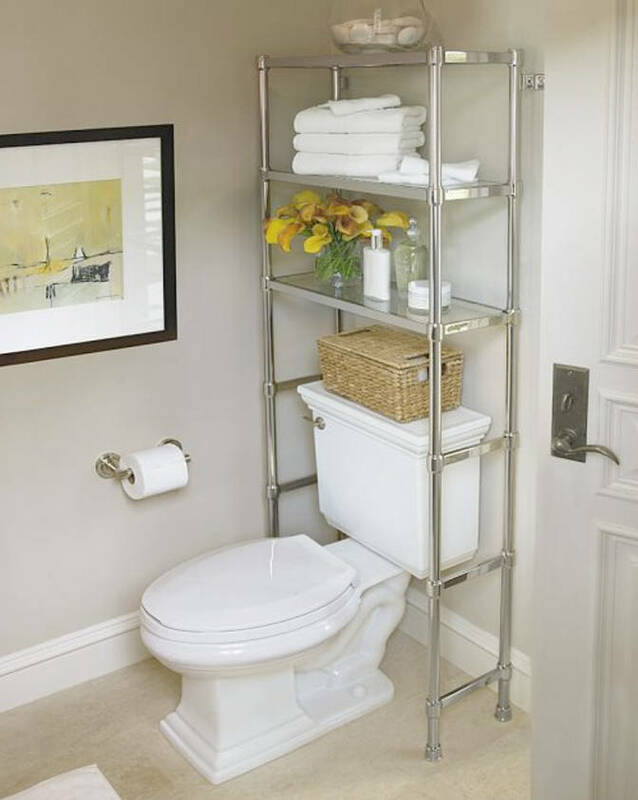 People can use smart storage ideas to avoid the shabby and clumsy look of the space. The storage can be conventionally made in an under the sink cupboard. The ladders could be used to hang towels, clothes instead of the pegs. A shelving system can be devised out of a simple metal wireframe over the cistern, which can then house the products as it is or by the use of wooden or wicker crates. This is where one can be creative to decorate the space by recycling the things at hand, things lying unused or discarded. For example, the waste GI pipes could be used to create lighting fixtures, empty bottles to make soap dispensers and reed fragrance diffusers, old baskets to create storage racks, etc. Though a minuscule space as compared to the entire house and the time spent, the bathroom space has a lot of scope for décor work. Lighting is one of the primary aspects that should be taken care of while decorating the space. One needs to be careful while decorating it, to maintain the balance amongst all the elements. The decorations, if done wisely, can help add elegance to space.